Start with our complimentary house made breads and honey lavender butter. All guests may choose one of the following items for each of the six courses. Every meal is served with family style potato and vegetables. Herb roasted potato, mashed potato and braised onion potato slices. Honey glazed carrots, cauliflower cheese and fine green beans. Yes, it's Haggis. The Scottish mystical beastie. Try it once and remember for the rest of your life the first time this amazing dish touched your lips. Served with crisp toast. Hot Smoked Finnan Haddock Dip. Wood-smoked haddock flakes in our warmed savory creamy cheese sauce served with crusty bread. Frazerburgh’s Chilled Shrimp, Watermelon and Goat’s Cheese. Succulent shrimp dripping with heather honey, served with round slices of watermelon and goat’s cheese. This will wow your taste buds. Blended with herbs, cream and fine Scots whisky, then sealed in sweet orange marmalade butter served with crisp toast. Amazing unlike you imagined. A fresh chicken egg with our homemade banger sausage. Coated with fresh bread crumbs, then deep fried till golden brown. Served with our traditional brown sauce and Poacher's Pickle. Perfectly wood-smoked salmon on a bed of crisp iceberg lettuce, lemon, red onion, capers, soured cream and served with buttered brown bread. Well, this is what we serve to all who enter our home on New Year’s Eve. A filling plate of goodness. Potatoes, onions and banger sausage. Now in the soup version. Everything we have that's green with the red, yellow and orange peppers, plus radishes, red onions and heirloom tomatoes. Crisp fresh and crunchy. Ye Aberdonian's Garlic Bone-In Rib Eye Steak. Our local Ream’s butcher top of the show steak, this is the most flavorful bone in cut of meat in the Fox Valley. Succulent, tender, juicy, never outdone for flavor. The Scottish really know good deep red meat, hung well to give the tenderness it deserves. Two to six weeks later, we are now ready to eat. Now, we are going to add a creamy garlic sauce to this. Enjoy. High-heat steamed just to hold the delicate flavor in with fresh herbs. Can have a little bit of pink in the middle, however, we can cook it longer for you if preferred. Served with lemon-infused butter. Simple, but the best. 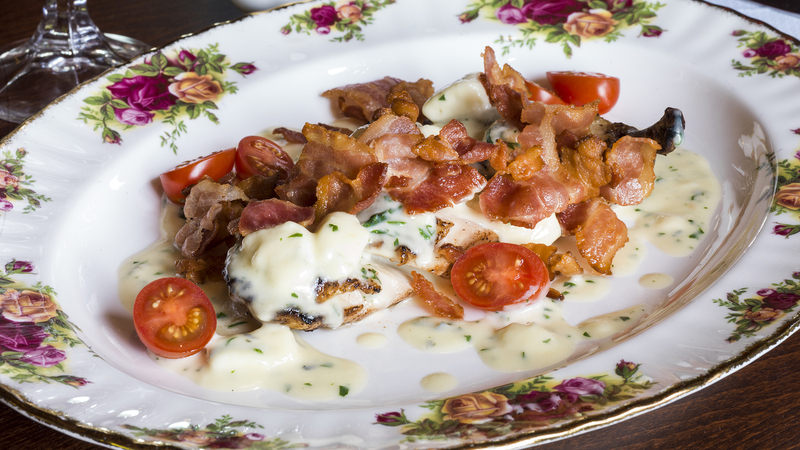 Smoked bacon with chicken breast and Stilton blue cheese sauce. At all the 11 restaurants I have had, every time I put this on the menu, it became the best seller. I can say no more. Agghhh! Best of the best venison. You will not be disappointed. Tender, sweet and moist. Little hint of herbs in the roasting, with a light reduction sauce. Succulent hind legs. Sweet and tender. Braised in rich prune gravy. Really love this dish! If you have never tried rabbit, this is a great one to start with. Well here we go. Scotland's most-sold dish. The haggis is made from a 150-year-old recipe. You may love or hate it — however, try it once. It may surprise you on how good it tastes. Served with our whisky sauce. Taylor's Breakfast, Edinburgh Breakfast, Scottish Blend Brodie's, Edinburgh Brodie’s Teatime, Edinburgh Heather, Edinburgh Thistle. By the bag or leaf. All served with our special house mints and mince pies. Also included is luxury crackers, blowers, poppers, party hats, balloons.